A tiny robot that slides on a layer of mucus right on up your intestine is the latest idea for making those colonoscopies more comfortable, say Dutch scientists. Right. Sometimes I wish I could just read a nice science fiction novel that I knew was all made up. Dimitra Dodou, from Delft University of Technology, in the Netherlands, is testing a polymer material that can cling to proteins found in the gut. That way, the little robot snail colonoscope could inch its way through your intestinal tract as slick as a snail climbs a glass window, on its own little trail of slime. It just gets better and better. 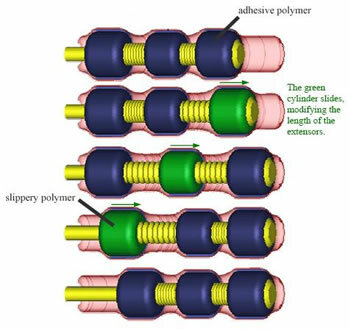 The cylinders that form the body of the snail-bot form alternating polymer-covered 'feet.' As the lead foot gets traction, the others are retracted and coated with water. Thus, it inches along. From experience, I can tell you that this little robot does not make me feel better about colonoscopies. The only technique that will make you feel better is a nurse with enough Midazolam hydrochloride (aka Versed) to make sure you don't remember a thing about it. Public Service Announcement: If you are fifty, get a colonoscopy this year! It's the best way to prevent colon cancer, which kills 50,000 Americans every year. Read more about the intestinal robot.